District Hall will host public gatherings and events for workers in South Boston’s growing collection of Innovation District businesses. The new one-story, steel-clad building on Northern Avenue is part clubhouse for the tech set and part monument to Mayor Thomas M. Menino’s efforts to transform the South Boston Waterfront into the Innovation District. Dubbed District Hall, the building will serve as the social hub of the Innovation District, hosting public gatherings and events, and offering hangout space for the new wave of workers in the neighborhood — those who know their way around computers and smartphones instead of the warehouses and loading docks that once dominated the area. And on Wednesday, Menino, just months from the end of his 20 years as Boston mayor, took a victory lap of sorts through the Innovation District, touring District Hall and reveling in all the change coming to the once-desolate neighborhood. Mayor Thomas M. Menino toured District Hall with (from left) Venture Cafe Foundation CEO Tim Rowe, driver Conor LeBlanc, and Brian Dacey of Venture Cafe Foundation. 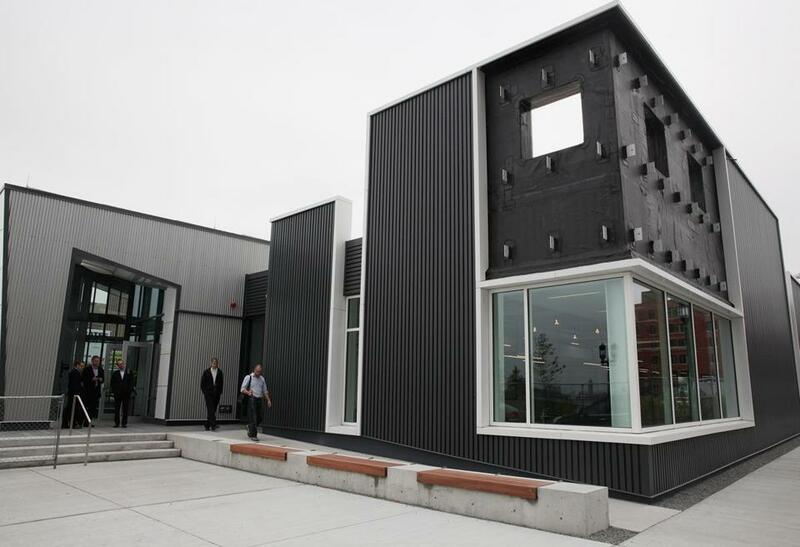 “This is what it’s all about — thinking outside the box,” the mayor said. At the time, the area was better known either for artists’ lofts or windswept parking lots, and the mayor had to personally persuade some of the first tech denizens, such as the start-up competition MassChallenge, to open there. In just three years, about 80 new businesses and organizations have moved to the district, many decamping from Boston’s suburbs. New office towers are in progress, including the $800 million Fan Pier project for Vertex Pharmaceuticals Inc., and so are about 200 so-called micro units to house tech workers. In fact, the area has become such a hot destination, and commercial rents have climbed so high, that tech start-ups are now looking to the Financial District and Downtown Crossing for less expensive office space. But when all of the building in the area is complete, the mayor said Wednesday, there will be plenty of room and prices will come down. The city hopes its $7 million, 12,000-square-foot District Hall will create even more buzz for the evolving neighborhood. It will be partially open in June but isn’t expected to be fully operational until this fall. It will include a restaurant operated by The Briar Group, a Brighton company that runs several Boston restaurants including The Harp and City Table. The building is being constructed by Boston Global Investors, as part of its 23-acre Seaport Square development project that will add 6.3 million square feet of office, residential, and retail space in the area. Global Investors will lease District Hall back to the city for $1 a year for five years. The city has an option to renew for another five years. “This center is a result of Mayor Menino’s vision,” said Tim Rowe, chief executive officer of the Cambridge Innovation Center, a co-working space in Kendall Square that is home to hundreds of young start-ups. The nonprofit arm of the innovation center, the Venture Cafe Foundation, will oversee daily operations at District Hall. The Venture Cafe operates a meeting space for entrepreneurs inside the innovation center’s building in Cambridge. Indeed, District Hall is among many efforts in the area to support the growth of the region’s tech economy, from inexpensive co-working spaces to business accelerator programs. In many ways, said Rowe, District Hall is similar to Microsoft Corp.’s New England Research and Development Center in Cambridge, which provides free event space for technology gatherings and classes. 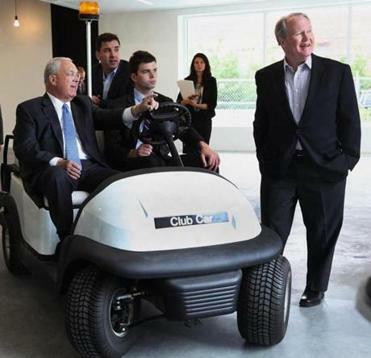 On Wednesday, Rowe rode in a golf cart with Mayor Menino, who is still walking with the help of crutches since a recent surgery for a broken leg, as they toured the airy building, pointing out the elements of the facility — such as interior garage doors that can be used to make spaces for large gatherings or small meetings. In the coming months, the hall will host Mobile Monday Boston, a gathering of mobile technology developers, and Boston Startup Institute, a training program for high school students. While a big symbol of the South Boston Waterfront transformation, District Hall is probably one of the smallest buildings constructed under Menino’s watch. During his time as mayor, some 80 million square feet of development have been added to the city, Peter Meade, Boston Redevelopment Authority director, said at the Greater Boston Chamber of Commerce breakfast at the Four Seasons Hotel on Wednesday.